Note: This is the bound book only and does not include access to the Enhanced Pearson eText. To order the Enhanced Pearson eText packaged with a bound book, use ISBN 0134289978. A new edition of the acclaimed, best-selling survival guide for teachers struggling to find answers to children’s challenging behavior. Stressing that every child has some kind of special need, especially children with challenging behavior, this book contains numerous practical, indispensable tips for responding to those needs, building relationships with children and their families, and preventing challenging behavior. It provides teachers with background information that enables them to understand why children behave the way they do and presents several evidence-based strategies to address their challenging behavior effectively so that teachers can select those best suited to the child and the situation. Useful to education students as well as in-service teachers in pre-school, child care, and primary school, the book emphasizes the importance of the teacher’s role in the behavior of children and encourages students and educators to reflect on their own values, feelings, and actions. In addition to up-to-date research on culture, dual-language learning, resilience, and inclusion, this new edition focuses on what stress can do to children’s brains, executive function, and behavior. The Enhanced Pearson eText features embedded videos. Barbara Kaiser and Judy Sklar Rasminsky first teamed up more than two decades ago to write The Daycare Handbook (1991). Since then they’ve published a number of award-winning and bestselling books and booklets, including Meeting the Challenge (a Comprehensive Membership Benefit of the National Association for the Education of Young Children in 1999), Challenging Behavior in Young Children (winner of a Texty Award for textbook excellence in 2007), Challenging Behavior in Elementary and Middle School (a Texty winner in 2009), and a series of webinars and guides on bullying for the Nova Scotia Department of Education (2013). Barbara Kaiser has taught at Acadia University in Wolfville, Nova Scotia, and at Concordia University and College Marie-Victorin in Montreal, QC, Canada. In addition to presenting workshops and keynote speeches on challenging behavior all over the world, Barbara has acted as a consultant for Mr. Rogers’ Family Communications, Inc., and was the chief consultant for Facing the Challenge, an instructional DVD based on Challenging Behavior in Young Children produced by the Devereux Early Childhood Initiative in 2007. She holds a master’s degree in educational administration from McGill University and founded and served as the director of two child care centers and an after-school program. Judy Sklar Rasminsky is a freelance writer specializing in education and health. Her work has appeared in numerous magazines, newspapers, and anthologies, and she has won awards from the National Association of Government Communicators, the International Association of Business Communicators, and the National Institutes of Health. For many years an editor at book publishers in New York and London, she has a B.A. from Stanford University and an M.A. from Columbia University. 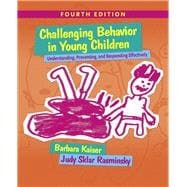 CHAPTER 1 What Is Challenging Behavior?